The longest running prime time animated series in the United States, The Simpsons has won many different awards, including 23 Emmy awards, including nine for Outstanding Animated Program (for programming one hour or less). However, The Simpsons has never been nominated for Outstanding Comedy Series, although the show was submitted in the category in 1993 and 1994. James L. Brooks, an executive producer on the show, won nine Emmys for The Simpsons as well as ten for other shows and holds the record for most Primetime Emmys won by a single person, with 19. The Simpsons was the first animated series to be given a Peabody Award, and in 2000 the Simpson family was awarded a star on the Hollywood Walk of Fame. The Simpsons also holds two world records from the Guinness Book of World Records: Longest-Running Primetime Animated Television Series and Most Guest Stars Featured in a Television Series. A can of Buzz Cola, an officially licensed product of Twentieth Century Fox. 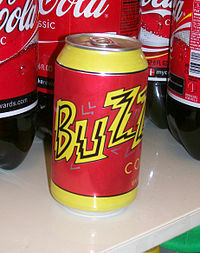 Buzz Cola is one of the many products in The Simpsons which spoofs real-life products. Buzz Cola was sold in 7-Eleven stores as a promotion for The Simpsons Movie. "Trash of the Titans" is the 22nd episode of The Simpsons' ninth season and the 200th overall. It originally aired on the Fox network on April 26, 1998. It was written by Ian Maxtone-Graham, and directed by Jim Reardon. It saw Steve Martin guest star as Ray Patterson, and U2 as themselves, although Larry Mullen doesn't say a word in the episode. The band's head of Principal Management Paul McGuinness and Susie Smith, an employee of Principal Management also make brief appearances in the episode. It won an Emmy Award for Outstanding Animated Program (For Programming One Hour or Less). This episode is dedicated to the memory of Linda McCartney. She appeared alongside her husband Paul in the episode "Lisa the Vegetarian". ... that from 1995 to 2003, an Arkansas radio station now called KZTD shared its "KBBL" call sign with the fictional radio station on The Simpsons? ...that Lisa Simpson's struggles to be a voice of reason in her family struck a chord with viewers in Japan and the broadcasters found they were able to turn the apparent dislike of the series around by focusing marketing attention on her? ... that MacHomer, a one-person play blending William Shakespeare's Macbeth with The Simpsons, was conceived by Rick Miller in 1994 while he was playing the minor role of Murderer No. 2 in a production of MacBeth? October 25, 2013: Marcia Wallace, who voiced Edna Krabappel, died. October 7, 2011: The Simpsons are renewed for two more seasons after the cast agreed to pay cuts. This will bring the show to a total of 25 seasons. July 14, 2011: The Simpsons receives three nominations at the 63rd Primetime Emmy Awards, for the episode "Angry Dad: The Movie", voice actor Dan Castellaneta and composer Alf Clausen. Clausen's nomination means he becomes the most nominated musician in Emmy history. June 23, 2011: It is confirmed that the show's 23rd season will begin on September 25, 2011. I did a lot of really crappy sitcoms before I got to The Simpsons. .. It's a writer's paradise. You have no interference from the studio or the network, so you really get to do what you want. I know that once I leave the show, it's not going to be that way. So I'm very happy kind of milking it to the end.